Spring is here and that means graduation parties, bridal showers and get-togethers to kick off summer break are just around the corner. So, what should be on the menu at these celebrations? 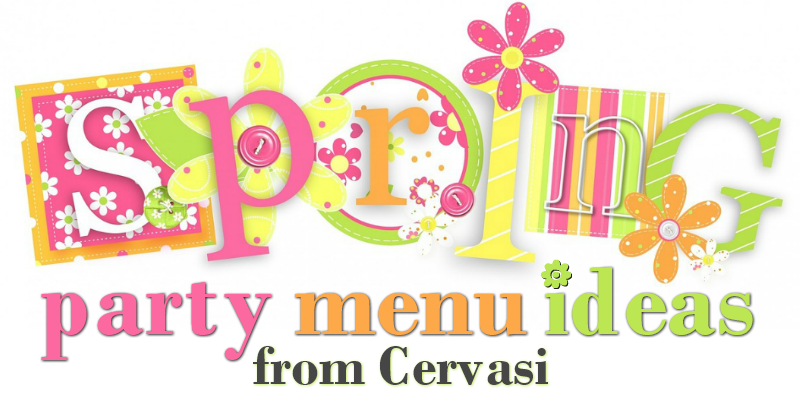 Here are a few Cervasi-inspired ideas to help get your party planning started! We follow the unwritten rule that you should have at least one dip available at just about any get-together. A crowd-pleaser and easy-to-make recipe is Artichoke Dip, a Cervasi family favorite. Another easy antipasti to use as a fun finger food for guests is the Tomato & Basil Bruschetta. It’s a nice, crunchy snack to have during pre-dinner conversations. A side dish staple, the pasta salad, is always a great addition to any gathering. Here, we feature three different Cervasi pasta salads that are sure to satisfy. Not a pasta salad pro? No problem. We give you step-by-step instructions in our Guide To Making Pasta Salad! Feeding a large group? Antipasti Scotcha (aka giant pizza roll!) is another Cervasi family favorite. You can customize it by including your favorite pizza toppings. A twist on this popular food – because who doesn’t love pizza? – will leave your guests happy and talking about their new favorite way of enjoying pizza. Ice cream pairs well with graduation parties and bridal shower cake, but how about swapping out the traditional creamy treat with your favorite Italian gelato. Kansas-City area stores and specialty ice cream shops offer tasty varieties. For more party ideas and tips, follow us Facebook and Pinterest. Your guests will thank you!